In today’s New York Times, there’s an article in the Sunday Styles section about Kelly Clarkson, the role model next door, as it were. Now, don’t get me wrong. I think Kelly Clarkson’s great. And she’s definitely a role model. As the article points out numerous times, Kelly isn’t exactly your typical pop star (think: physique), and yet carries herself with confidence and candor. With that said, I can’t understand why Taylor Swift made her way into this article. If the writer alleged that Taylor Swift, like Kelly Clarkson, is the typical girl next door, I’d agree. However, Taylor is invoked with a negative perspective and is contrasted to Kelly as the anti-girl next door. What? Since when does being tall and blonde preclude someone from being a so-called girl next door? (As my partner says, “I don’t know why being fat makes you more down-to-earth or authentic.”) Didn’t the writer (Jan Hoffman) read the recent awesome New Yorker profile of Taylor, which portrays her as a normal, yet brilliant contributor to society? I don’t see Martin’s point. Well, I do, in a way — of course, Kelly Clarkson breaks from the mold in that she’s not thin, has trouble dating (“If I were gay, I’d probably have more luck”), and wears brunette hair (now). But there’s no need to bring Taylor Swift into this conversation. If anything, Taylor has proven herself to be the atypical down-to-earth superstar. Only a handful of her songs relate to notable men (there was some suggestion in the article that she dates celebrities, as well); most of her songs relate to the intricate difficulties of relationships–from a grounded, girl-next-door perspective. 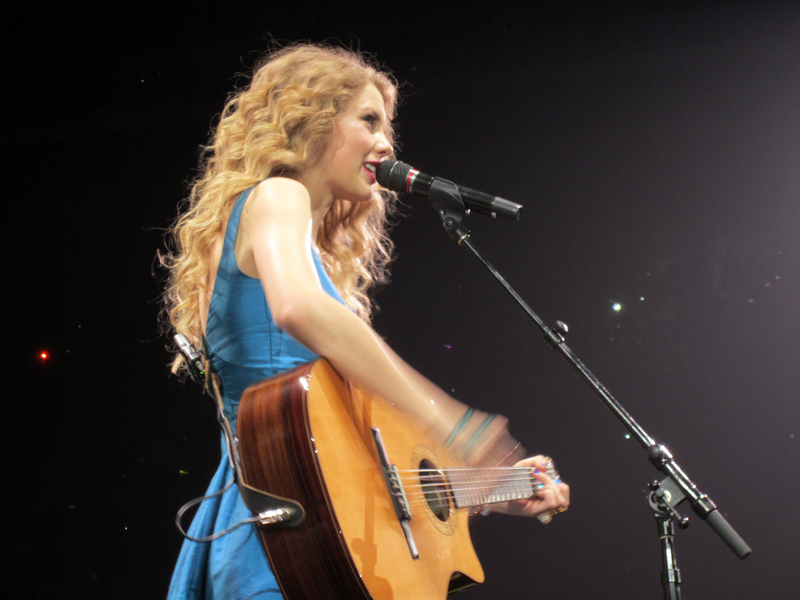 If listeners connect with Taylor, it’s because they feel they are the girl singing the song, not because they want to be her, as Martin suggests. Author of one semi-known book, Martin positions herself as an expert on teen idols. She isn’t, nor is Ms. Hoffman (nor am I, for that matter). Martin ignores the obvious reality of Taylor’s influence on young girls–a positive one. Unlike most of her peers, Taylor doesn’t smoke, drink, or do drugs. Martin’s Taylor Swift acumen is sorely anemic. In conclusion, I am horrified that the Times chose to publish an article that trashes Taylor Swift in order to achieve some kind of revelation about Kelly Clarkson.